I was going to write something entirely different today and indeed had even started writing it when I happened across a segment of this newly released animated video by the Imperial War Museum in London which I thought many others would like to see. The animation depicts every single bombing raid by first the RAF and then also the USAAF in WW2. It’s fascinating to watch and though it concludes on D-Day, it is easy to imagine how things could only get worse in Germany from thereon in. But you can get an idea of it from these photos of London after The Blitz. Of course, Germany wasn’t the only place to suffer as can be seen by the map below of countless bombing raids on just London below. 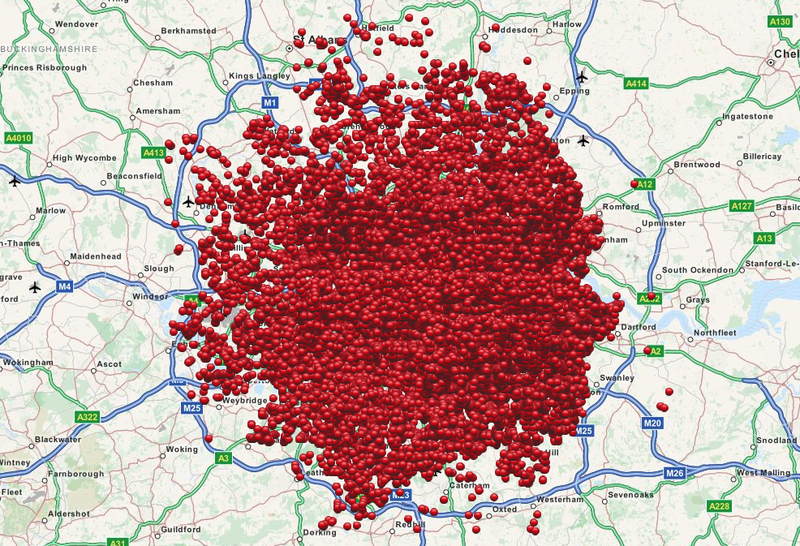 An excellent interactive website which shows the location of every single German bomb dropped in London can be found at the Bombsight website. This entry was posted in history, London, WW2 and tagged D-Day, Germany, history, Imperial War Museum, RAF, The Blitz, United Kingdom, USAAF, Video, war, World War 2, WW2. Bookmark the permalink. Wow… wars always shake the roots of the earth. They do. It’s incredible how you can see the scale of the bombings month by month, you get the feeling things were only going to get worse for Germany even with the D-Day invasions. Yes, I’d be interested to see how long after D-Day the bombing increased and whether it tailed off in the final months or was stepped up even further. used to play in Cheyne Walk near St Thomas Moore’s Church late fifties, Nottinghill Gate early 60’s Holland Park was pretty Derelict in those days, not forgetting the French Onion seller on his Bicycle. but our Parents would never Talk about it. .